Plandent are a specialist supplier of instruments and consumables to the dental industry, with sister companies throughout Scandinavia and Germany, they form the largest retail dental group in Western Europe. With their last printed catalogue being published back in April 2005, the Plandent Sales and Marketing teams decided it was time to increase product sales yet again by bringing out an updated catalogue. As all of their product information on their in-house back office system, they wanted to find a method of automating the production of new catalogue pages directly from a XML export file of data and without the need for costly manual designers. 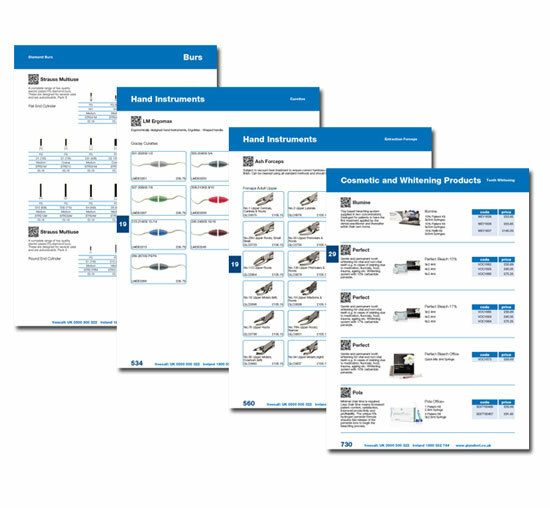 They found what they were looking for in Pindar Creative's 'Custom Catalogue®' solution. After agreeing initial template designs for the pages, enriched product data in XML from their back office system will be used to generate high-resolution print ready PDF files. More time to prepare product information. Zero page make up costs. Product information to market faster.